Wrinkles and loss of firmness. TOPICREM � has selected an ally of choice for its anti-aging range: hyaluronic acid. Naturally present in the skin decreases with age, result: your skin dries out and wrinkles appear. The replenishing cream resource your skin regains its suppleness and radiance; illuminates your complexion! Through Aquaxyl �, cutaneous microrelief is smoothed. Especially suitable for dry skin, this rich carefully avocado extract, shea butter and baobab oil nourishes, repairs and regenerates the skin for maximum comfort. 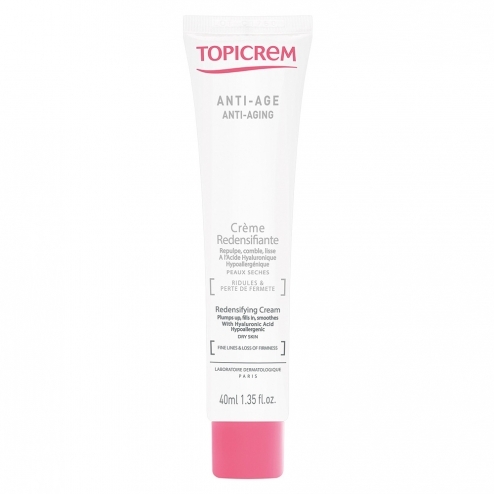 Apply anti-aging cream on Topicrem face and neck after cleansing and dried.